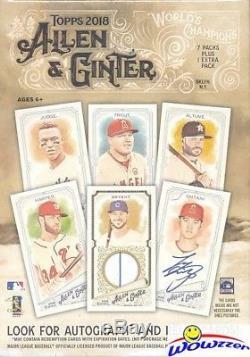 2018 Topps Allen & Ginter Baseball EXCLUSIVE Factory Sealed 16 Box Blaster CASE. We are proud to offer this Original 2018 Topps Allen & Ginter MLB Baseball EXCLUSIVE Factory Sealed CASE! This Factory Sealed CASE includes SIXTEEN (16) EXCLUSIVE Factory Sealed Blaster Boxes! Each Factory Sealed Box includes 8 Packs! Each pack includes 5 Cards plus 1 MINI Card! S Greatest Champions and Iconic figures! Look for Randomly Inserted autographs, relics, originals, book cards, cut signatures, rare parallels, RIP cards and much more! Look for Randomly Inserted Retail Exclusives: Gold Bordered Mini Parallel Cards and Exotic Sports Mini Cards! Look for Autographs, Relics and Cards of MLB Superstars and Rookies including Shohei Ohtani, Aaron Judge, Ronald Acuna, Mike Trout, Bryce Harper, Gleyber Torres, Rafael Devers and Many More! Look for Autographs of other Sport Stars and Film Stars including Chris Hemsworth (Thor), John Boyega (Star Wars), Lindsey Von, Sloan Stephens, Tony Hawk & Many More! Good Luck with your Pulls! Wait to pay until all items have been won OR 7 days after oldest item was won. (Please Note - we are not open on the Weekends and Holidays). We will NOT list a lower value or mark orders as gifts. We answer all emails within about 24 hours, Monday through Friday, and work to resolve all problems as quickly as possible. Unless an item is damaged, it generally needs to be in the condition it was received, either undamaged or factory sealed, to be eligible for a return. Note on Factory Sealed Boxes and Cases and Graded Cards. S samples and are not guaranteed to be in any particular box or case. On Listing for Beckett BGS Graded Cards. We answer all emails within about 24 hours Monday through Friday. We are an Internet only company; we do not have a retail location. Get business information that counts! - Vendio Counters are active content free. 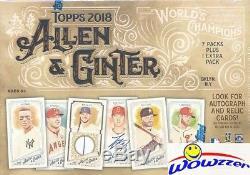 The item "2018 Topps Allen & Ginter Baseball EXCLUSIVE Factory Sealed 16 Box Blaster CASE" is in sale since Wednesday, July 18, 2018. This item is in the category "Sports Mem, Cards & Fan Shop\Sports Trading Cards\Baseball Cards". The seller is "wowzzer" and is located in Irvine, California.